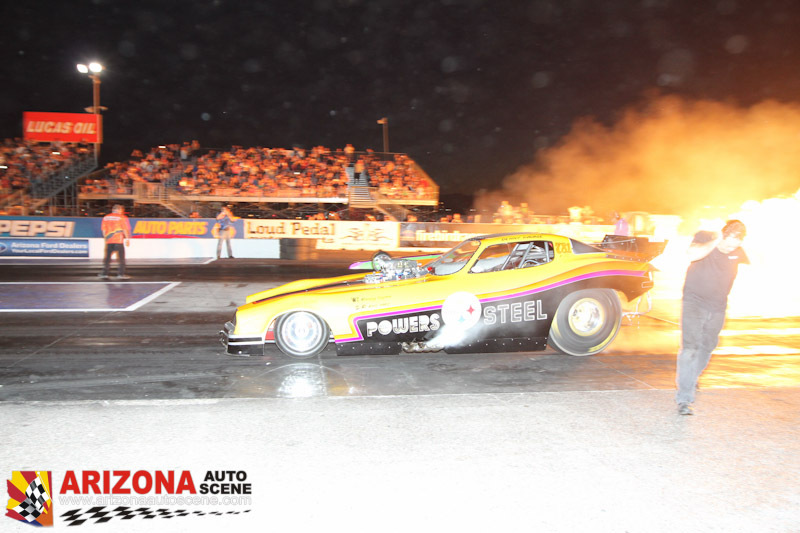 Thirty years of racing in the Phoenix desert Firebird International Raceway put on their final event. March 30th brought it all to an exciting finale with everything that the fans have loved over the years. Robosaurus, Monster Trucks, Trophy Trucks, and of course the Jets vs Funny Car match ups. 30 years ago, on the opening night of Firebird, the Invader was there. She was a Westinghouse J-34 powered jet dragster piloted by Al Eierdam, built by Bill Mattio and Lee Austin, and was one of the quickest cars at the time. Flash forward to 2013, and at the final event, the Invader is here still. Now a Pratt & Whitney J-60 powered jet dragster piloted by Curt Eierdam, built by the Jet Shop at the hands of Tommy O’Brien, and is one of the quickest cars now. But also joining the Invader is another team car; the Avenger piloted by Craig Eierdam, built by LMS racing and brings the show full circle. JET FX team was also joined by the Lucas Oil sponsored jet dragsters of Tony Franco, the Terminal Velocity and the MAV TV Missile in battling with the Nostalgia Fuel Funny Cars for the final bragging rights. Invader faced up against John Hale in the Powers Steel funny car in the first round. With the win light coming on in the Invader’s lane it was 1 to 0 in favor of the jets. Craig in the Avenger was paired up with Tim Boydchuck in the Troy Lee Designed entry. As with the Invader, the Avenger scored another win for the jets. The MAV Missile driven by Tony Franco Jr gave a great effort but new safety system shut the car down late in the run giving the funny cars a win. But Tom Bogner in the Terminal Velocity shut down the Mr. Explosive entry. So with the first of two rounds over, jets were a head 3 to 1. Second round was unfortunate as whatever funny cars were able to make it back were quickly dispatched, and the Terminal Velocity and the Invader both made single passes as their opponents were unable to return to make the second round.